Peel the tomatoes, cut in half and scoop out the seeds before cutting into small dice. Cut the melon into wedges, remove the skin, scoop out the seeds and then cut into small dice. Pick and chop the mint leaves. Cut the feta cheese into cubes. Bring the water to the boil and add a pinch of salt. Pour the water onto the cous cous, cover with cling film and then leave the cous cous to absorb the water. Once all of the liquid has been absorbed and the cous cous has cooled down a little, break it up with a fork and add a drizzle of olive oil. 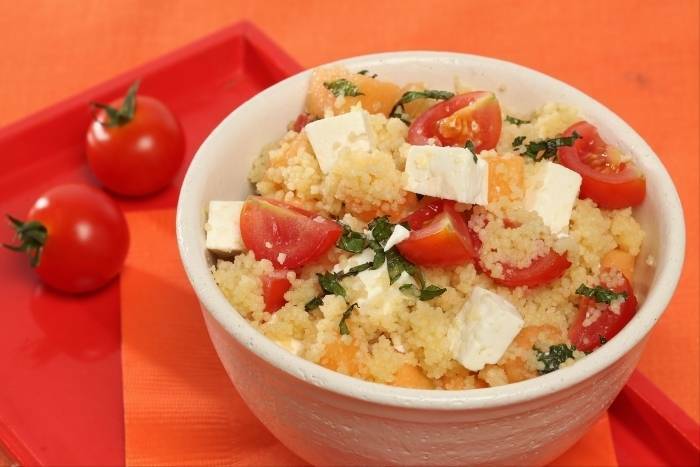 Add the melon, tomatoes, feta and mint leaves and season with salt and pepper. Finish with a squeeze of lime juice to serve.